Good News…!!! Cyient is going to recruit B.E, B.Tech candidates for the Software Engineer – Trainee through Cyient Recruitment 2019. Furthermore, the recruiters of the Cyient are looking for the people who work with complete dedication and for the achievement of the company. Moreover, Freshers can only have the chance to apply and attend the Cyient Recruitment 2019. Therefore, freshers who accept the work as a significant challenge can apply for the Cyient Recruitment 2019. So, interested candidates can apply for the Cyient recruitment 2019 Drive. Moreover, before applying for the drive candidate should check the official portal. Candidates who have finished graduation, post graduation in the B.E, B.Tech stream can utilize the golden opportunity. Aspirants who are technically sound and strong in programming skills can apply for the drive. The drives are conducting in various parts of the company. From the above table, candidates will get a brief idea about the Cyient Recruitment 2019 drive. And also you will get the details of various positions, educational qualification, various location, and the industry. Aspirants can test your luck with the Cyient Recruitment 2019 drive. The company will hire freshers through Walk-in drives, off-campus drives, and referral drives. So, every candidate utilizes the opportunity that has come to your doorstep. In this post for the better understanding of the people, we are providing information like Payscale, Hiring process, Eligibility criteria and Registration for the drive. So, everyone should go through the article. The eligibility criteria for the Cyient Recruitment 2019 has various steps. That is available in the below sections. Candidate should complete their post-graduation or under graduation with good percentage and technical stuff. So scroll down the cursor pointer and have a look. A Cyient is a global service provider focused on engineering, manufacturing, data analytics, networks, and operations. And the company is founded in the year 1991. The industries are Aerospace, Defence, Energy, Transportation, Communications, utility media navigation, Mining, Oil & gas, Off high way. The headquarters are in Hyderabad, India. The area served by the company is worldwide. The founder name is B V R Mohan Reddy. As per 2017, the employees are 14,000 and revenue is 3,699.7 crore(us$570million). They understand deep rooting, enduring relationships with global industry leaders. By under the business needs, goals, culture and core values. As part of the company strong cooperation ethics and co-creating business and public value is essential to them. In this direction, the client foundation has developed a framework that unifies our diverse corporate social responsibility initiatives, such as government school adoptions, digital literacy programs, and social innovations and technology products. There are various steps for the Cyient Recruitment 2019. That is available in the following. The levels are as follows. Check the eligibility criteria according to the job roles in the official website cyient.com. Aspirants should open the careers page first and search for a particular company. The company will appear on the screen and click on the registration form. Therefore, You will get a form and enter all the information in the way. Before submitting to the page, you will get the PDF form. Therefore, check the given date without any mistakes and submit it to the page. Therefore, save the details by taking a hardcopy or by saving in a copy softcopy. 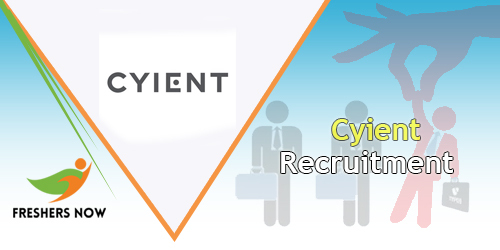 By checking the above information about the Cyient Recruitment 2019 we hope you are satisfied. Is it useful for you are not? Then for updates about the government job openings and private job openings visit our official website Freshers now. If you have any doubts, drop a mail or leave a comment. We will provide the best solution for your comment. We will collect the entire information for you all. So, please keep visiting our page often.